I've made guanciale before, so i'm not going to go into too many details about its awesomeness. It's basically like pancetta, except different. The fat on a jowl is very different to regular fat. It has a rather odd texture to it, it almost has a "crunch" to it. It's much richer than pancetta too. Thanks to Jimmy at Eatitatlanta blog, I found myself in possession of a jowl from my favorite pork place of all, Caw Caw Creek. Look at the size of this thing! Emile at Caw Caw said he thought it was from a Large Black pig, which apparently refers to the ear size, and not the physical size of the hog. Emile lets his pigs grow to be rather large before slaughter, I can only imagine the size of the head of this pig! Look at that! I trimmed it up a little but to clean up any soft sinew and connective tissue. Not much though. This is only the jowl portion of the pig face. Can you picture how big the rest of the pig is!? 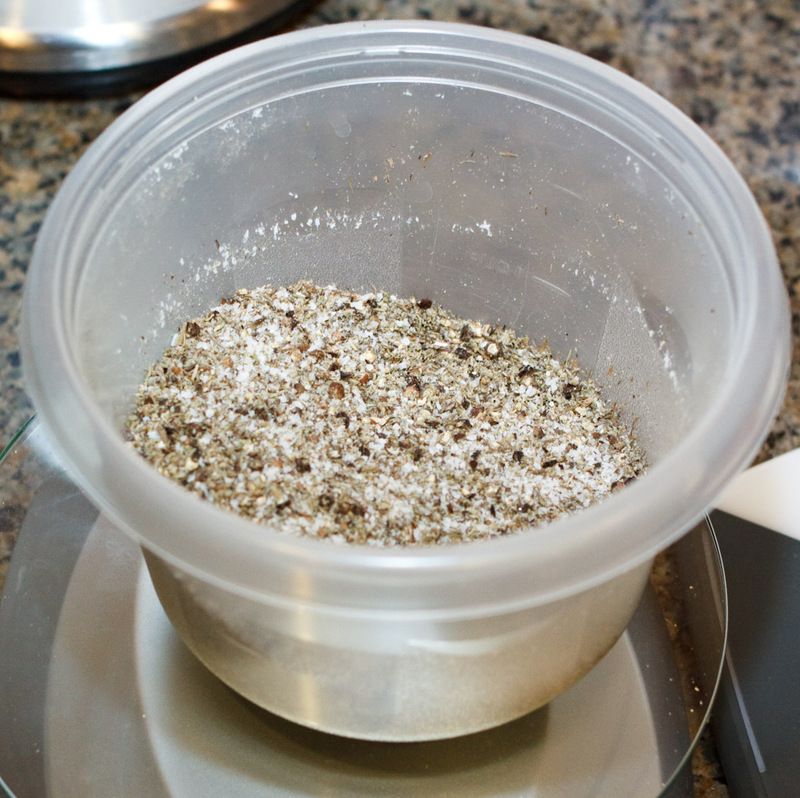 Here is the spice mixture well combined and ready to be applied. The jowl was well rubbed with ALL the mixture. Given the thickness and the quantity of fat, i'll leave this to cure longer than for a pancetta, probably 20 days or so. It'll then hang for at least 30. Never gets old. Looks as big as my Mangalitsa jowl..........very impressive. that is beautiful. actually looks like a nice piece of belly. can't wait to see how it turns out. 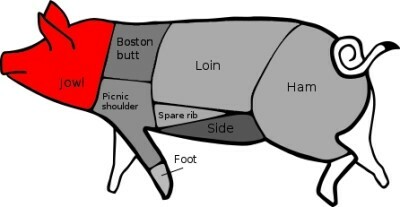 I have about 4 mangalitsa jowl going right now, first two should be ready in the next couple of weeks. I look forward to seeing this done. Yum. Wow Jason, that jowl looks awesome! Those pigs must be huge. That will make for some good eats. Lookin good! I love having guanciale around. But I see that you didn't remove the glands, any reason? Russel, i had read to remove the, but i didn't know what htey looked like! Can you tell me where they are on my piece, so i can remove them after the cure? 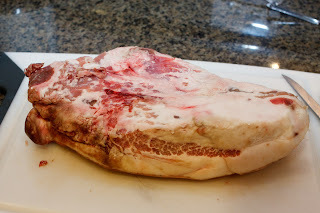 I've been making pancetta for many years, and always had a plan to make guanciale. Never did. But you've inspired me. Grazie. mister meatball: awesome! Go for it! Jason the Guancial looks awesome I would love to try this and Pancetta sometime. I have a problem would like to ask your opinion. I just set up a batch of Salami 4 types both 1.5 and 2.5 casings. I am incubating it now in my small bathroom can you email me so I could send you a couple pics and maybe give me some advise. My curing chamber is half finished and I have about 30 lbs of meat stuffed and incubating. chipman, i can't contact you without your email! Hey Jason. Yeah I had the same problem finding the glands the first time I made it, so the second time I made a point to take pictures. The post is here. Thanks Russell, i don't think i have any of those on this piece...where do yhou see them on my pictures? Oh I didn't see them in the photos, just asking. Depending on how the jowl was trimmed, how fatty it is, etc., you kindof have to poke around a bit to find them. got it Russell, thanks. I'll keep an eye out for them. In my experience the glands resemble small spheres with a gelatin-like texture. They lack the striations of skeletal muscle and are usually completely surrounded in fat. It appears that there are a few in the first image. Thanks James, i'll take a look when it's done curing, but it all seemed like muscle. We made a successful Pancetta and decided to try a prociutto. It seemed great for the first 4 months of hanging. It had a bit of fuzz on the surface, but that doesn't bother me. As it dried, a slice in the front face started to widen, and I'm not sure if it got as well coated with salt on this surface. Recently, it has started to smell a bit like ammonia, especially near this crack. I took it down and tried adding more salt to that crack. Still, I'm a bit worried. Typically, if there is an ammonia smell do people toss the whole thing? I can't really help, but ammonia is definitely one of the smells i'd be concerned about. Love your blog. I don't have a curing chamber yet (and it's too hot in NYC right now to hang cure in my apartment) but I was wondering if I could use the bacon preparation (cure in ziploc, then roast on low temp in the oven for a few hrs) on a jowl, rather than a belly slab? The bacon prep I'm referring to is the one in Ruhlman's book. Christopher, i think ti would work, but jowl has an odd texture when eaten in large pieces. It doesn't get meltingly tender like belly, the fat has a "crunch" to it....not my favorite really. Hi Jason, Christopher again. What about making the guanciale as you did here, but curing it on a rack in the fridge? What are the exact details I need to know regarding that process? I remember in the past you said you tried it both ways but I couldn't find the explanation of how the fridge method worked. Christopher: that should work. Cure it per my instructions with salt and spices and curing salt etc. in a zip lock bag, then rinse it (or don't), pat dry and put in on a cake rack in the fridge over a plate to allow air to circulate around it. It'll dry in 2-4 weeks. Once it's done wrap it in a moist paper towel and put in a bag for a day to soften a little, then use. Hi again Jason, I'm currently curing in the fridge. It appears to be drying out a lot...getting a little crusty and hard around the outside. Is that normal or do you think I should put some wet salt in the fridge, maybe underneath the roasting rack I have it perched on, to get the humidity up a little? In the fridge it will dry out pretty fast and will get pretty mummified on the outer surface. It's normal. No need to put anything below it. Once it's done in 2-4 weeks wrap it in damp paper towels and put in a zip bag for a couple of days to de-mummify the surface. Why the change in recipe from last batch? Noticed quite a few tweaks. Also noticed your % are of water, rather than meat weight. I did the math and it seems it's by meat weight - curious why the water. Ooops...that's a typo regarding hte % water. Will correct. Thanks. this one deviated to keep it simpler to taste the quality of the pork. We did 20 jowls today with this recipe. Pretty keen to see how they turn out. That's a lot of guanciale Kevin! Is that personal use or commercial? Jason - it's R&D for commercial for a café & pizzeria. A friend of mine tackled the project, I'm just helping and providing the dry cure space. Jason, do you recommend using dried thyme/sage for this recipe? Whenever I've cured with fresh herbs, I've noticed some kind of unpleasant discoloration. Just wondering what your thoughts were on that! Zack, yes, i do normally use dry herbs. I don't know that i've noticed anything odd when i have used fresh though. Jason - Did you leave the skin on for this preparation? Any info appreciated. Hey! Great Blog! Just pre-curing latest jowl! First attempt was a success! Fridge dried! i smoked half the last one too once dried and it turned out beautifully!! Last was skin on, this time skin off. What's the group's preference? Thanks Jason! i love the crunch the skin gives when rendered! Made linguine carbonara yesterday for lunch - the whole reason for making Guanciale in the first place...was wonderful! But guanciale with grilled artichoke and sundried tomatoe reduced in white wine for potatoe salad...foget about it...!!! Doug, i remove it before cooking, but i guess if sliced thin , a little crunch from the skin could be tasty! 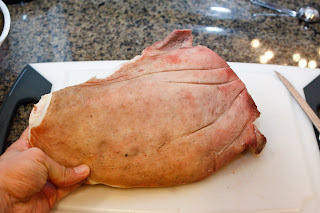 I am a big fan of your blog and have started two jowls using this recipe. 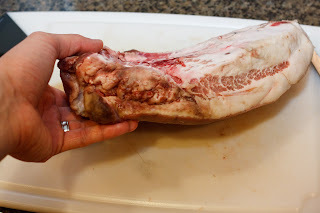 What cure times would you recommend for a 1300 g jowl and a 1100 gram jowl. I realize with the equilibrium cure that the time in cure has more leeway. I've seen 10 - 15 days recommended. More importantly: After four days in cure my 1100 gram (A little over 1 inch thick) jowl has sprung a leak! 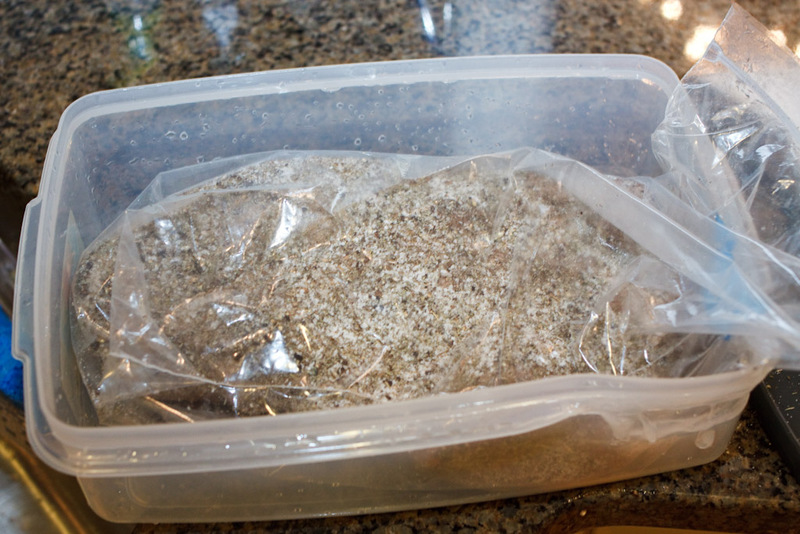 The ziplock has a puncture and I lost most of the brine that had formed. The jowl has firmed up some and I dont think it needs to be thrown out. Should I put the jowl in a new bag with some additional salt and add time to the cure? May end up salty but it would be safe. hard to say, but i'd guess 10-15 days as you said. I assume you didn't catch the brine in a bowl or anything? hrmm..yah i'd resalt it and keep going. Not sure how much salt to recommend though...i guess it would be better to be too salty than not enough though. Are those measurements for dried or fresh sage/thyme?